The hotel complex Messonghi Beach, built on the estuary of the Messonghi River, in a natural beauty spot where the vegetation and the waters of the Mediterranean Corfiot landscape mingle with the sea, in a green landscape respecting the environment and its customers, offers all the comforts for unforgettable vacation. Messonghi Beach Hotel is a large holiday resort with more than 900 rooms, surrounded by lush gardens, between the villages of Moraitika and Messonghi. With respect to the wonderful natural landscape, the management took the responsibility to proceed with a waste management program to become a role model for the island of Corfu and to promote its facilities as “environmentally friendly”. 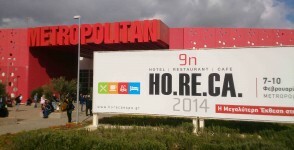 The large number of visitors and the features of the hotel, All Inclusive offers, lead to a large production of both recyclable and organic waste. The problem that had to be addressed was the management of organic waste with the aim of diverting it from ending up in the landfill. The chosen solution consisted of 5 stages. In the first stage was conducted an integrated waste management study by expert consultants for waste management of the company QAdvisors. The purpose of the study was to evaluate the current situation, which identified the sources, the different categories and the quantities of waste coming from different parts of the hotel. A techno-economic evaluation was also carried out, identifying sustainable actions and the necessary waste management equipment. 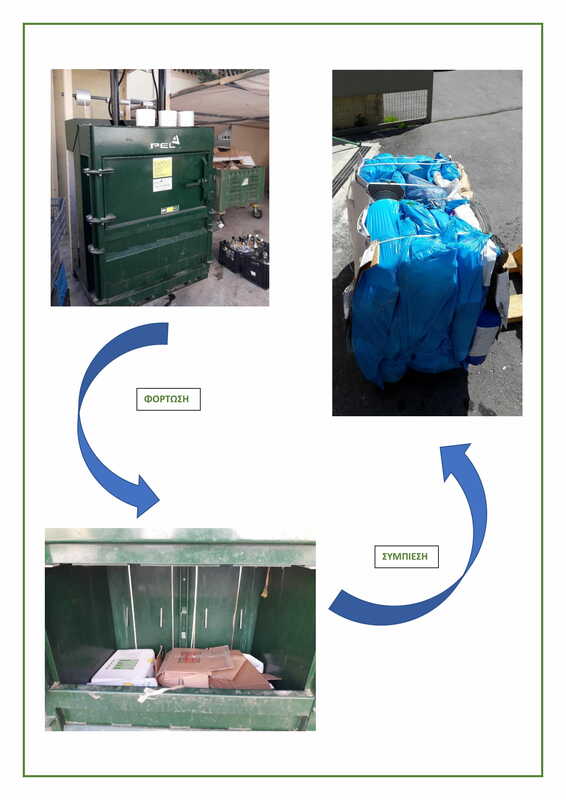 In the second stage and basis of the study was organized the sorting of the organic material in separate bins and the training of the personnel so that the collection of the waste takes place in different streams. In this way, apart from the separate collection of the organic waste, a significant increase in the sorting of recyclable materials has been achieved, which can provide a small revenue for the company. 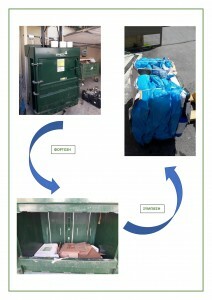 The third stage concerned the reduction of the volume of recyclable materials and their exploitation as products for sale. For this purpose, the vertical press PEL B1500 was used with which the recyclable waste is compressed and bundled in packages of approximately 150-200 kg. The fourth stage concerned the reduction of the volume and weight of organic waste. 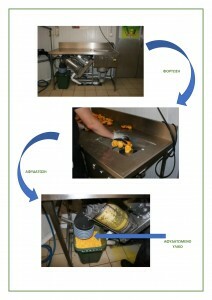 This was accomplished by installing DEHYDRA BENCH dehydrating unit. This unit consists of a powerful waste bin which mashes all organic waste which is then led to a centrifugal unit to make the solids separate from the liquids. The fluids are removed through the drainage system while the solid residue is concentrated in special containers. 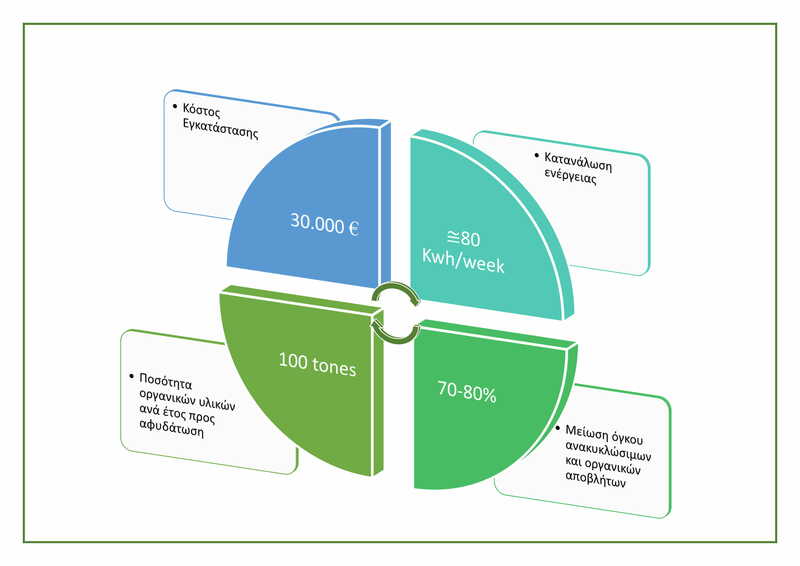 In this way the volume and weight of organic waste is reduced from 50% to 70%. The process is shown below. 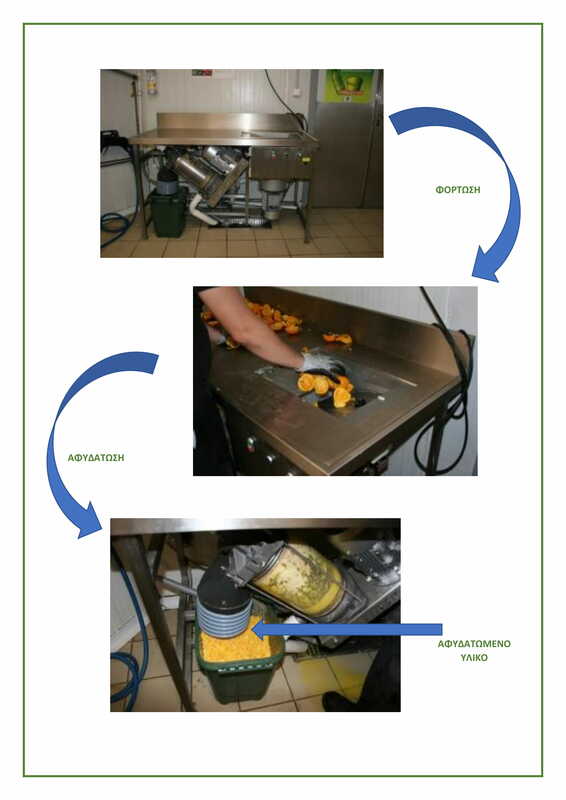 In the fifth and final stage of the process the produced material derived from fresh plant waste is led to simple aerobic composting bin while the dehydrated food waste is collected by the hotel but reduced in weight and volume, thus reducing the cost of collection. The hotel complex Messonghi Beach incorporates “Green Techniques” to reduce the volume of recyclables, dehydrate organic waste and produce compost.